One of the most important features of this blog has been the selection of a photograph (or painting courtesy of Rob Ijbema) to accompany each post. Thanks to some artistic ambitions of my youth, I am fairly picky as to which photographs are included; I strive for quality and a different viewpoint. This has led me to form opinions on the quality of offering from each team website and I have to point at the Renault site as being by far and away the best of the lot. Their photos are supplied by a UK company called LAT Photographic and they seem to have assembled a team of the most artistic and innovative photographers of all. 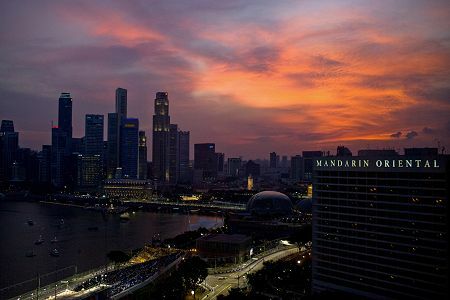 Take the photo of Singapore above, for instance - on no other site will you find such atmospheric shots to set the scene for the race. When it comes to the cars, you can rely on LAT to supply interesting angles and photos that contain the essence of the sport - the speed, the competition and the colors. Note the stark color contrasts of the picture above, picking out the car as the focal point in a field of green and blue, the angle chosen adding to the impression of speed. It is clever stuff and, when compared to the fairly standard fare offered by other teams, it stands out as exceptional. 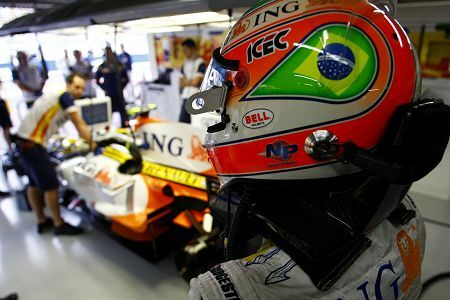 These guys are good at team shots, too, the chosen pic of Piquet in the pit garage setting him in a background of mechanics working on the car. This is careful thinking about the whole photo, not just taking a few snapshots in the awareness that anything will probably do, so addicted are the fans of the sport. But it is in the portrait of the star that the talent of LAT's photographers really comes to the fore. 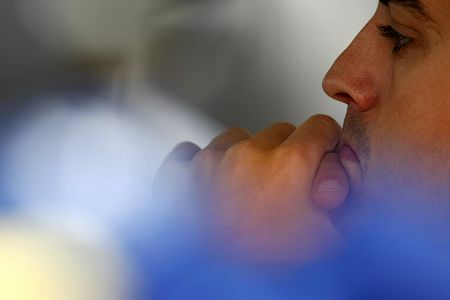 I like the way this pic of a thoughtful Alonso has concentrated on essentials, only the eyes and a hand being necessary to convey the message. 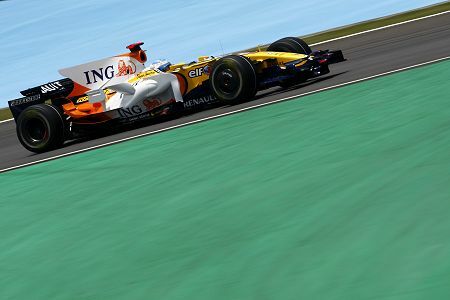 All else is a blur of background and the Renault blue and yellow, a hint of the activity going on around the island of concentration that Fernando is at this moment. So many of Renault's photos contain the signs of the great photographer, the attention to detail (some of their studio shots are abstract in effect), the careful planning, the vision to see a new and interesting angle. I have to thank them for such superb quality and how it helps me in constructing this blog. It is often noted that Renault have the most fan-friendly site on the net and it should be mentioned that their gallery is an important part of this; hats off to whoever designed the whole show. The PR benefit to the company is huge and it means that I look forward to writing about the team and its drivers - I know I will have no difficulty in finding a suitable photo to encapsulate the article. Thank you, Renault. I often wondered where you got all the great pictures from. I assumed it was hours and hours of effort but you just nick them from Renault. How a hate this blog… One of my off-season subjects will be photography, so you came and write about it. Now, I do not know if I will find any originality in any of my sentences. Anyway, I love photography. For once in my life I assumed that I could be a pro and an artist on the matter and maintain my life with it. So, the life guides you to other ways and I´m only a designer now, but a happy designer. I love he Cahier archive site. I agree that the pictures there are very special.